Halloween is almost upon us, and soon all those little goblins, ghouls, and witches will be lining up at your door with hands outstretched. Most candy, especially those that are chewy and sticky, and those that take long to dissolve in the mouth like hard candies, are very bad for the teeth. They either can get stuck between teeth and coat the teeth with sugar, which harmful bacteria love to feed on, or continually bathe the teeth in acid and sugar, which is equally as damaging. Since chocolate melts fairly quickly in your mouth, and because it contains calcium which can be good for teeth, it is an excellent choice to hand out. It is best as plain chocolate, without the gooey or chewy centers, which could get lodged in teeth. The smaller bars and boxes that Halloween chocolates often come as also limit the serving size of these treats, which means less in a child’s mouths at a time. Sugar-free treats, such as gum or lollipops, can actually stimulate saliva in the little mouths. Saliva is beneficial to the teeth because it can cut down on germs and help prevent tooth decay. Sugar-free gum comes in many flavors and best of all, it usually only contains less than 5 calories per stick. Even the American Dental Association recommends sugar-free gum as good choice for Halloween treats. Options like Pixy Stix or Sweet Tarts are full of sugar, that’s true, but they also do dissolve rapidly in the mouth. Sometimes these types are applied directly on the tongue. This means since they don’t stick around, their impact is less then choices like hard candies or those sticky, taffy types. All natural juice in boxes is great for teeth and may help keep the little ones hydrated on their trick or treat trek. Try to find options that are 100% juice and have no sugar added, as these will be better for teeth. Often children are very thirsty from all that walking around, so some refreshing liquid might be just what they are craving. Though no one wants to be known as the house without candy, there are some pretty cool non-candy treats that you can hand out. Think about supplying mini cans of play dough, bouncy balls, bottles of bubbles, glow sticks, vampire teeth, or temporary tattoos instead of candy this year. Another trick for parents is to feed children before they go out trick or treating. That way they will have a full stomach and are less likely to start binging on their haul before they get home. It also best to limit the amount of candy your child consumes at once too. Coming up with plan to only partake in their sweets after a meal, and making sure that they are brushing twice a day, is also recommended. 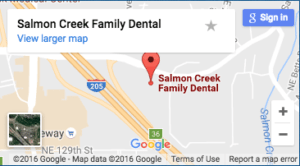 As your dentist in Vancouver, WA, we want you and your children’s teeth to be as healthy as they can. If you have any questions about teeth or oral care, please contact us today!